“The Asian American unit in the Office of Community Affairs was developed in 1996,” said Shawn Williams, Manager of Community Affairs and Employee Communications. “For the last 14 years, the health and safety fair has allowed our department to continue to strengthen our relationship with the Asian community,” Mr. Williams said. Dallas Police Department resources will include the Mobile Unit, a Police Squad Car for show-and-tell, the Low Rider and Bike Patrol, and Recruiting. Dallas Fire & Rescue Department will also attend the 15th Annual Asian Safety and Health Fair with a Fire Engine on display as well as Sparky the Fire Dog. The Dallas Sheriff Office will be on hand to interact with attendees and display their Dallas Sheriff Mobile. 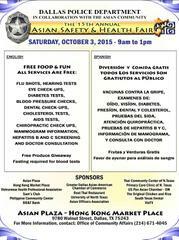 Several free health services will be provided such as: flu shots, hearing, eye, and Diabetes testing. Blood pressure, dental, Cholesterol, Hepatitis B and C Screening, Mammogram Sign up, HIV Tests and Doctors Consultation will also be provided to the public free of charge. North Texas Food Bank is donating produce to those in attendance. This year’s sponsors include: The Asian Plaza & Hong Kong Market Place, Vietnamese Health Professional Association, Texas Health Resources, BB&T Bank, Thai Community Center of North Texas, Philippine Community Center, Best Thai Restaurant, US Pan Asian American Chamber of Commerce – Southwest (USPAACC-SW), Asian Peace Officer Association of North Texas, North Texas Food Bank, Greater Dallas Asian American Chamber of Commerce(GDAACC), University of North Texas, the Original Chicken and Rice, Sam’s Club, South Texas Dental, Parkland Hospital and individuals. For additional information or questions call The Office of Community Affairs & Employee Communications at 214-671-4045.